Hyderabad: Ikea of Sweden opens its first Indian store in Hyderabad on Thursday, a ₹ 1,000-crore bet that affordable furniture and assisted assembly will draw buyers in the world’s fastest-growing economy to its swanky 400,000 sq ft outlet. It has been a milestone that’s more than a decade in the making, and the company expects to welcome as many as 6 million visitors a year. The showroom has some 7,500 products, of which about 1,000 will sell for less than ₹ 200 each. It’s the first of 25 stores Ikea plans to open across the country by 2025. Based on feedback from its home visits, Ikea expects a majority of sales in India to come from the living room and kitchen categories, the company’s country sales manager, Christian Kampe, said. Many people were keen to invest in their homes and make changes in their living rooms, he said. “We saw that it was very strong and these are the strategies, which will be our first step in going forward," he added. Ikea’s launch comes at least 12 years after it started studying India. Patrik Antoni, Ikea’s deputy country manager, said the company is also looking at smaller cities in the future. “People love homes here, this is the difference between India and other markets. If you want to party or just celebrate, you call people home," Antoni said. If two-seat sofas costing as little as ₹ 5,990 and ₹ 7,990 double-bed frames aren’t enough to lure shoppers, the Hyderabad store features a 1,000-seat restaurant—one of the largest across Ikea’s 400-strong global chain—that will serve a mix of Nordic and local dishes, including biryani for ₹ 99 a plate. Chicken and vegetarian meatballs, for ₹ 129 a serve, will replace the traditional Swedish ones made with beef and pork. Ikea has also acquired land in Bengaluru, Mumbai and Gurugram and plans to open shop in Surat, Chennai and Ahmedabad. “The pace of opening stores in India will intensify," said Harminder Sahni, founder and managing director of consulting firm Wazir Advisors in Gurugram. “Ikea has never failed; it’s never closed a single store in its history." According to GlobalData, a data and insights solution provider, rising disposable incomes and improving living conditions of urbanites present vast opportunities in India. Against the backdrop, the company forecasts the Indian home sector to grow at a compound annual growth rate (CAGR) of 10.9% during 2016-2021 and reach ₹ 4.979 trillion by 2021. Ikea’s Kampe also pointed out that the ₹ 200 price tag was identified as a number that Indians will be attracted to. “We also have 500 products under ₹ 100 within the 1,000 items under ₹ 200," he said. Ikea’s competitors in India include Godrej Group’s Godrej Interio, Future Group’s HomeTown, Nilkamal Ltd’s @Home, and Durian Industries Pvt. 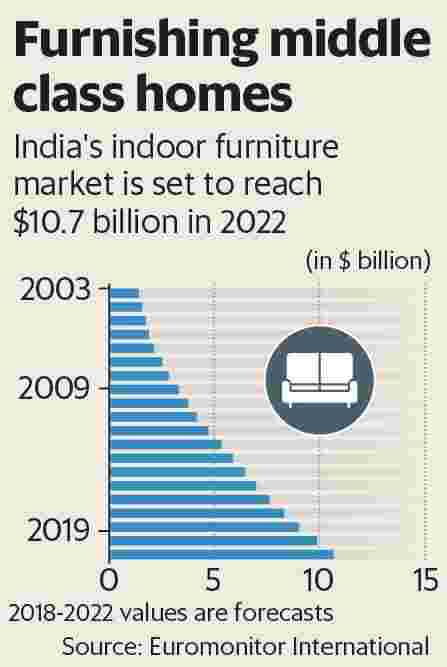 Ltd’s namesake furniture business, along with mom-and-pop stores vying for an indoor furniture market predicted to expand about 8.8% annually through 2022, according to Euromonitor. Concerned that the absence of a strong do-it-yourself culture in India could impede acceptance of Ikea’s traditional model of self-assembling furniture, Ikea partnered with local start-up, UrbanClap, and hired 150 staff to offer paid delivery and assembly options, and plans to introduce an online store in conjunction with the opening of its Mumbai outlet in 2019. Around 950 people will be employed directly by Ikea in Hyderabad, with an additional 1,500 jobs created indirectly, a company spokesperson said. Kampe added that an average Ikea store does around €100 million of business (annually) and the company plans to watch how things go in the first year and achieve the same target in India as well, in the next five years. Bloomberg contributed to this story.